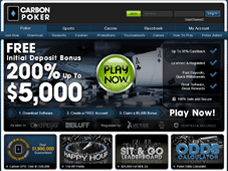 Carbon Poker has launched the first real-money mobile application among US facing online poker rooms as the company hopes to get a leg-up on their competition with the release of a mobile poker application. The Merge Poker Network’s flagship room began testing the application in February, 2013 and then beta testing for real money in August. 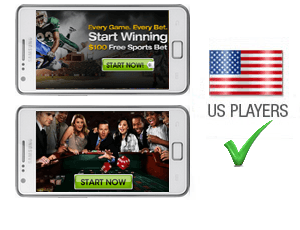 The mobile application, which is browser based works across iPhone and Android platforms and is the first of its kind in the US online poker market. While mobile applications have been a mainstay in regulated markets for years, it is awesome to finally see US players getting a chance to play on the go. Since the app is browser based there was no wait time while the app installed or downloaded, and I was immediately prompted to login as I went to the Carbon Poker Mobile webpage. 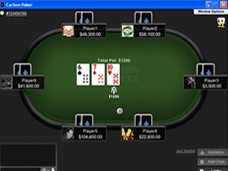 After logging in, players are prompted to choose between no-limit and fixed limit cash games and will immediately be familiar with the style of the mobile client. It has the same color scheme of the normal Carbon Poker desktop application and will immediately be familiar to players who are familiar with the desktop product. It’s worth noting that Carbon is still in the beginning stages of their mobile offerings, and that becomes evident immediately as there are no tournament options, and players can only play in cash games up to $.50/$1.00 no limit and $3/$6 limit Hold’em. Still, as their first foray onto the mobile poker platform, Carbon has put out a respectable product that is relatively bug-free. I didn’t experience any problems when using the application on my android phone and though it isn’t flashy and full of features like other mobile software, it performs well and is a seamless experience like their desktop software. Carbon looks to be molding their mobile app around their desktop experience, and it is a wise decision, their software is among the best online and second to only the big boys, like PokerStars and Full Tilt Poker. The setup of the application is simple with several buttons running across the top of the screen. There is a lobby filter, a homepage button, deposit page and list of tables of active tables. Moving quickly from one page to another is simple and there no slowdown between different menu buttons. Overall, it is super user-friendly and is easy to jump into; within seconds you can deposit money or be sitting at ring game. This is truly all that matters when it comes down to it, and the Carbon app passes with flying colors. Gameplay is fast and fluid with clearly definable buttons and an easy to use bet slider. I hate to beat a dead horse, but the scheme is almost identical to the desktop software which is a beneficial aspect for players. The idea of a mobile application is a simply to offer a condensed version of the desktop version and Carbon has succeeded hugely in that sense. It is a testament to Carbon’s developmental team that things have translated so easily to their mobile offerings. The lobby filter isn’t as in-depth as it possibly could be, but that will probably be upgraded in newer versions. It allows players to spot tables by the amount of players, highest and lowest stakes and by table names. These aren’t anything remarkable but are still a nice touch. General settings, such as auto posting blinds, auto muck and even a four-color deck are all available options. Auto-rebuy is also available, making cash game play a breeze and easy to keep your stack full which may be tougher for players playing via mobile. While the app is more than capable of providing an excellent mobile poker experience for players there are a few drawbacks. Firstly, currently only one table is available to play at a time, but this will be changed soon with future updates. Also, although it is possible to deposit via the app, players cannot request withdrawals, but again, this program was only released to the public over a month ago, so I expect this feature to be added shortly. The Carbon Poker mobile poker application isn’t state of the art as far as mobile poker offerings go, but it is an excellent start, especially for the much maligned US poker market. With continued improvement, it could easily become one of today’s top mobile poker options. The core basics and interface are outstanding. From here, it is just about continuing to update and improve the app’s performance, something that the team at Carbon Poker is excited tackle. Best of all, US online poker players no longer have to sit on the sidelines of the mobile poker explosion and have found a home at Carbon Poker.